At I-expatriate we have designed our system from a user perspective. Our applicant tracking system gives you all the functionality required for a recruiting HR manager in a way that’s simple, quick, and effective allowing you manage the whole process from one centralised hub. 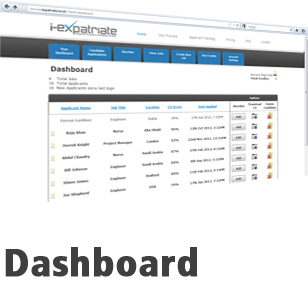 Every client has their own unique login to the I-expatriate dashboard. Here you will be able to see all of the new application across any roles. A candidate will have details displayed such as his percentage match to the job his location and the ability to be able to shortlist and download his CV. 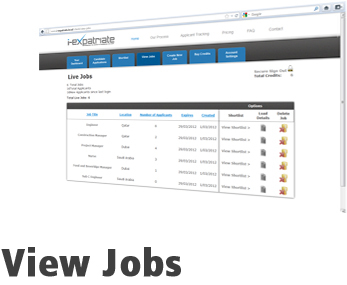 I-expatriate allows you to be able to view all the jobs you have live, the number of applications for each specific role and the relevant shortlist. 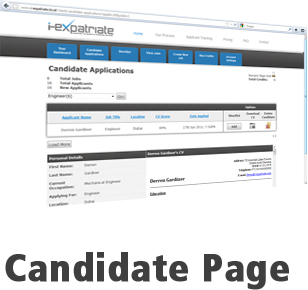 The candidate page gives you a closer look at the candidates. We have a unique CV preview function allowing you to quickly and easily look through candidates with the ability to contact, or shortlist the relevant ones. 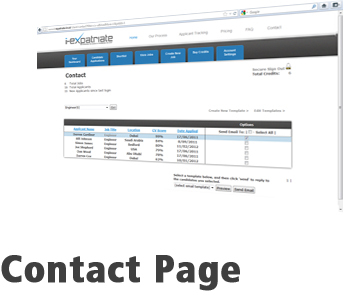 I-expatriate’s contact page is again based around unique technologies. This allows you to mass reject unsuccessful clients, by email, quickly and easily. You can create and customise your own email templates, and your last action will display next to the candidate so you can easily keep track of who you have contacted.